Over the last couple of years, I’ve felt an increasing pull – almost a seduction – to be alone outdoors in nature. Yet I’ve also felt huge doubt about my capabilities in that environment. Could I navigate well enough? Could I deal with unexpected circumstances? I felt a big grey vague shadow of ‘I’m not good enough’. In live in the beauty that is Inverness, in the Scottish Highlands and I’ve a small but lovely outdoor community with whom I walk and cycle. But there was something about being alone in the wild that got under my skin. When do you give your children the time to speak, the time to formulate a thought or give an answer with the time to get it wrong and start again? No clocks, no homework, no digital distractions, no rushing. When, as a matter of fact, do you spend 2 hours talking to your children? I mean, no distractions, just you chit-chatting about this and that, without telling them what to do. Bovinophobia: Is it normal for hikers to be scared of cows? The fear was real when I said this to my husband, about halfway through the first day of our mid-March walk along the South Downs Way. We’d spent the morning slogging through mud: the path from Lewes to the Way was well trodden (by horses) and churned into a messy graveyard of chalky, gooey muck. Every morning at 06:30 I stumble downstairs, sleepily flick the switch on the kettle and make myself a pot of tea. It might be green tea, it might be black. I quite often spill a bit on the sideboard. A few minutes after I have drunk it and perked up. At no time have I given a thought to how these dry fragrant leaves made their way to my pot. This time last week I was deep in Sri Lankan hill country, hiking up steep mountainsides, rocky paths, stone staircases, through mahogany forests and the ubiquitous, far reaching tea estates that cover the mountains and provide this island nation’s major export. I'm addicted to hiking. I just love it. Sounds geeky, doesn't it? But I don't care. I head out hiking every weekend and often during the week. If I can't get out, I become grumpy. I've got the bug and I can't (and don't want to) kick the habit. But why do I enjoy it so much? 3 Amazing Things that happened this week. 1. Ariana Huffington takes her meetings while hiking! Tim Ferriss' podcast chat with Arian Huffington has been an absolute highlight of my week. She is a truly extraordinary woman whose achievements are remarkable. Not the least of which is the fact that she has started having "hiking meetings" - scheduling meetings whilst she hikes, whether on the phone or in person. You can download or listen live to the podcast here. 2. 9 Life lessons to make you laugh and learn. If you don't know what to do with your existence, look no further. I really enjoyed this short speech from Australian comedian, Tim Minchin. It is full of pearls of wisdom wrapped up in a good dose of humour. Watch the video below, courtesy of Goalcast. I was really quite touched by this story, illustrating the capacity of the human mind for resourcefulness and compassion. A group of breast cancer survivors in Kenya is knitting prostheses for women who have been affected by the disease. Check out the video here care of the BBC. Having had the honour of being invited to a christening in Mileševa Monastery, outside Prijepolje, on Thursday and having spent a night in an almost inaccessible village, reached via a one hour 4x4 ride up and down a dirt track, we sped across country on Friday to stay in Kopaonik; a mountain resort best known as the centre of winter sports in Serbia and, as is always the case with such places, a rather drab and untidy building site in summer. After a short pitstop in the city of Niš we saw out our last weekend of the road trip walking in the Balkan Mountains. You may not have heard much about the Balkan Mountains or Stara Planina (Old Mountain) as the areas is known in Serbian, but this range stretches from the south eastern corner of Serbia, spanning Bulgaria, to the Black Sea. Zlatibor is a mountainous region of pine forests and rolling meadows in western Serbia. Famed locally for its health benefits and spread over an area of about 300 square kilometres it provides a truly different environment for hiking. 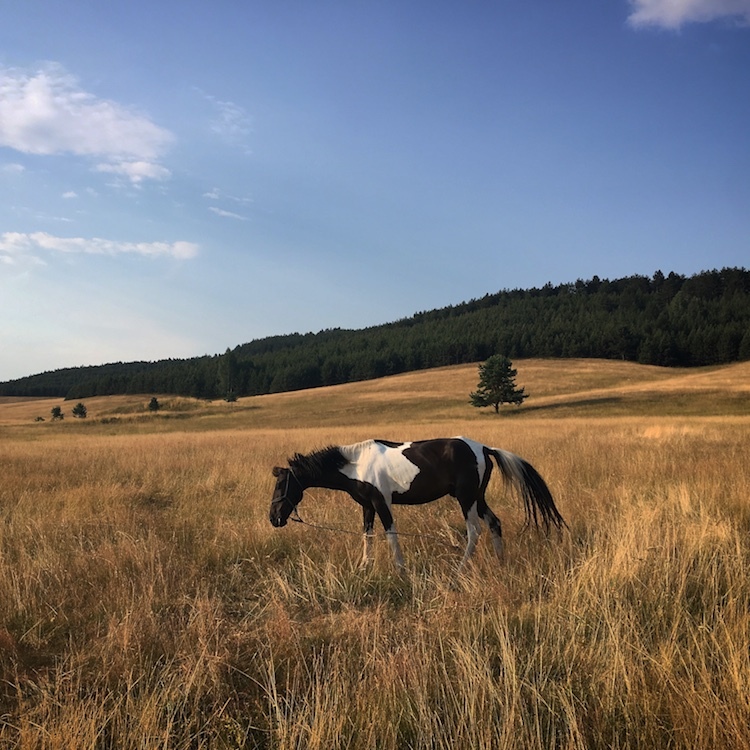 The resort of Zlatibor is not in itself beautiful but offers plenty of accommodation as is a great base to explore this spectacular countryside. We stayed in the Mona Hotel. We chose to double back on ourselves to spend a couple of nights here which gave me the chance to have a tramp in a kind of landscape which someone pointed out to me looks not unlike Tibet or Mongolia. Although it doesn't reach heights beyond 1496 metres (Tornik; the height peak). Here is a video I shot early one morning, profiting from the soft glow of the morning sun which turns the grasslands a rich golden colour. As I mention in the video information is tricky to come by for any longer walking but I have put a few links below as well a information on other places of interest in the vicinity. Hike details: This walk was around an 11km roundtrip, from Zlatibor resort to the top of a mountain called Crni Vrh, which is 1177 metres above sea level, so a total ascent of around 35 metres. 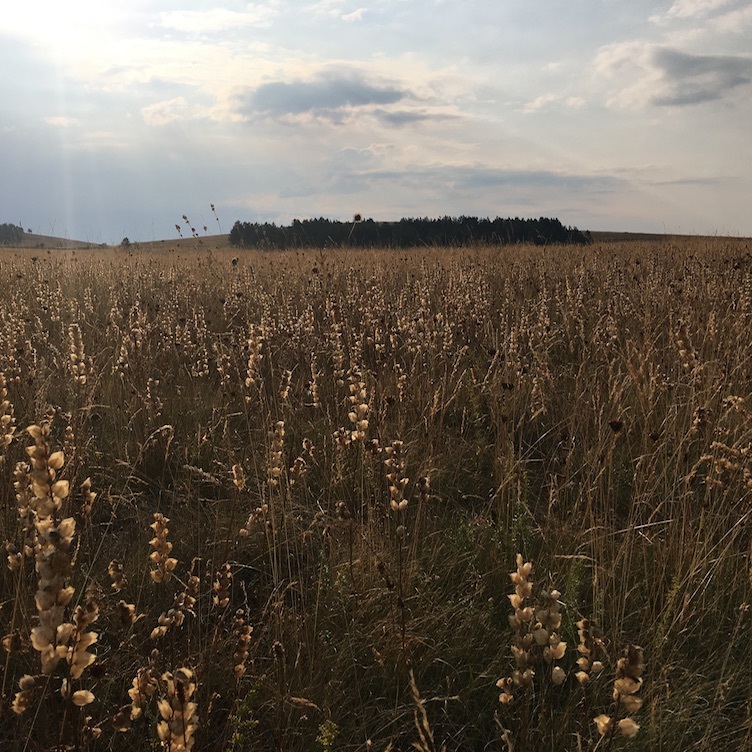 I will do some more research and attempt to put together a better resource for hiking trails in the Zlatibor region but for the time being the bets place seems to be to follow what others have tracked. A 30 minute drive from Zlatibor resort is the old village of Sirogojno. This perfectly preserved display of traditional Zlatibor living (largely 19th century although the neighbouring church dates from the mid eighteenth century) is essentially and open-air museum. Šarganska Osmica is an old narrow gauge railway that traces a figure of eight in the mountains. Built in 1925 it is a spectacular ride as well as seriously feat of engineering. 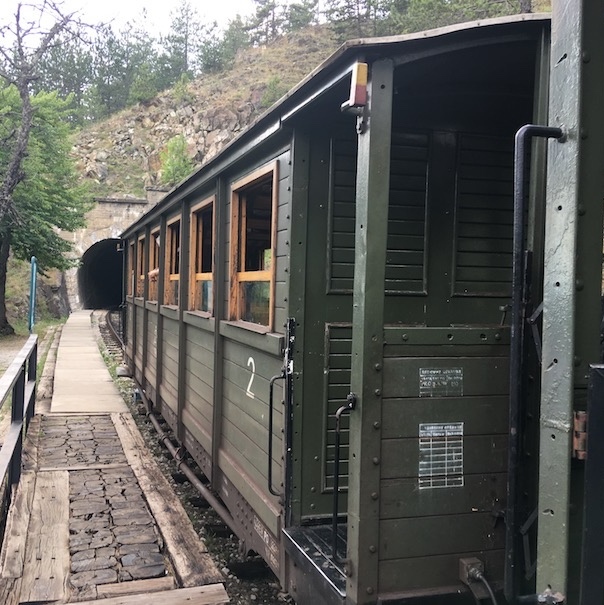 When we stopped in this area a few days ago we stayed in Mokra Gora, which is just over 30 minutes down the road from Zlatibor and the main stop on this train line. Between Zlatibor resort and Sirogojno is Stopića Cave. The cave entrance is 18 metres high and 35 metres wide with bats flitting about near the entrance. Its is made up of a number of large halls and a spectacular waterfall. The highlight of this vast chasm is a series of pools which have formed in a staircase-like cascade, which at some time of year can be filled with water. Th deepest of these is seven metres. Our experience of this is that you will be pushed to join a tour but it is not compulsory, especially given the fact that it is in Serbian! Once you have your ticket you can just walk in. Also known as Kustendorf, this is essentially a fake village built by Emir Kusturica (for his film Life is a Miracle) in a traditional style with timber framed buildings, restaurants a theatre and of course holiday lets. Every year it hosts the Kustendorf Film and Music Festival as well s other events and you will notice that each street bears an interesting name - below is my favourite I spotted. In the 1970s a young, hungry and penniless Robert De Niro found himself in this part of the old Yugoslavia. Taken in by the locals, he stayed for some time to recover his strength and was treated with such hospitality and generosity that he would never forget them. Many years later he named a daughter after their mighty river, Drina. In the last couple of days we have followed the course of this fast-flowing river, immortalised by Ivo Andric (Yugoslavia's Nobel Prize winning writer) in The Bridge on the Drina, and inspirer of Hollywood’s finest. As if the romance of the De Niro story weren’t enough to want to believe it, the landscape and the warmth of the people gives it greater strength. After a morning of wine-tasting and car-failing we installed ourselves for the first weekend of our summer road trip, in Salaš Stojšić. A pleasant Salaš (a traditional type of farm in this area - my favourite being Salas 137), its stencilled walls and intentionally old-fashioned charm is typical of these rural farmhouses. Outside there is a wide spread of gingham-clad tables, fruit trees, a braying donkey and the mandatory charcoal perfume of grilling meat that seems to impregnate the hot, still air on a summer weekend in Vojvodina. Its just a few day before I go off to the Alps for the best part of a week, reacquainting myself with the glaciers and ridges of the mountains that inspired my love of the outdoors. It is surprising how long-lasting a lot of outdoor gear can be, even when left unattended. So I have scraped a bit of rust off my crampons and we are good to go! Actually I have taken delivery of quite a few new bits this week, as I prepare of our adventure road trip in Serbia, Bosnia and Montenegro. Below are a few which I shall be reviewing over the summer. I am not used to requiring waterproof covers for everything but if I have learnt anything since buying the packraft it is the value in keeping everything in one dry bag and the phone well and truly safe. I have a 20l dry bag and two phone covers to try out in some white water in July! The last time I filtered water was using tablets which was difficult to stomach, but things have moved on since then and Water-to-Go seems to provide a reasonably-priced option for water-filtration. I think that will get a lot of testing over the month of July. My GoPro is never far from me and since my last mini grip tripod broke in two places whilst I was in the Cairngorms in April I have been looking out for a new one at a reasonable price. The Fantaseal® Robust Octopus seems to fit the bill, we shall see how it performs. I have never used a solar charger but with the profusion of devices that my family seems to have amassed I felt it made sense not just for myself in the mountains but also for all of us on the road. I will also be blogging on our trip so would hate to be without power! I have the Anker PowerPort Solar Lite (15W 2-Port USB Solar Charger) which should give plenty of power! I will start posting reviews in early August for these items and some clothing... now back to #30DaysWild.